Top (Left to Right): Kirara (featuring Yuyushiki), Kirara Max (featuring Kiniro Mosaic and Is the Order a Rabbit? ), Kirara Carat (featuring A Channel). Bottom (Left to Right): Kirara Forward (featuring Yumekui Merry and Hanayamata), Kirara Miracle! (featuring Sakura Trick), Kirara Magica (everything Madoka Magica). Manga Time Kirara is a manga magazine published by Houbunsha. It was started in 2003 as an offshoot of the Gag Series magazine Manga Time, but specializing in moe yonkoma. Because of the popularity of the moe style in the 2000s, Kirara became a family of four magazines (five before October 2017), three (plus the one cancelled magazine) of which continues with the original specialization of moe Slice of Life yonkoma. The other one, Manga Time Kirara Forward, while maintaining the moe style, serializes non-yonkoma series with more traditional narratives — for example, Yumekui Merry is a supernatural action series that wouldn't be too out of place in a shounen mag like Shonen Sunday. 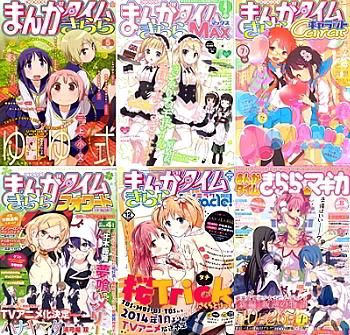 The Kirara family of magazines have also become somewhat infamous for carrying works with high levels of Les Yay, or in some cases out-and-out seinen Yuri Genre series, Sakura Trick being one of the biggest examples that got an anime. Though in most of the 2010s, it seems at least one manga from the Manga Time Kirara family gets adapted into an anime nearly each season, sometimes more than one. It is common enough that Moe SliceOfLife comedies are starting to be called "Kirara-esque" even if they are not from a Kirara manga. Many of their anime adaptations are licensed by Sentai Filmworks for North American viewers, and some have also received English dubs, such as Kill Me Baby, Yumekui Merry, and Hanayamata. In addition, because of the format, each month release of one of the five magazines under the family can carry up to 26-27 series. Works in these magazines are often authored by novices of professional manga; many of them were (or still are) doujinshi authors or illustrators. Early Installment Weirdness: If it was today, a series like Doujin Work won't be allowed to be serialized on Kirara per se. It can probably be serialized on Miracle! or Forward, though. Nice Girl: It's usually expected to have at least one girl fitting into this bill. Romantic Two-Girl Friendship: Sexuality is never really brought up, but there is a lot of subtext in more than a few works. Schoolgirl Series: Also very common in these works. Schoolgirl Lesbians: It would be hard to find a work that didn't have one or more girls with blatant crushes on one another. Seinen: Many of these works are usually geared towards an older adult male audience. Slice of Life: A common theme in these works. The One Guy: Recurring male characters are very very rare in non-Forward Kirara series, enough so that when a series DOES feature a regular male cast it's noticeable (see Place to Place, Castle Town Dandelion, Doujin Work, GA Geijutsuka Art Design Class, and Blend-S). Token Mini-Moe: It is expected that at least one female character will fit into bill in any Manga Time Kirara works. Artifact Title: It is editorially independent of Manga Time for a long time. Darker and Edgier: Manga Time Kirara Forward. In contrast to the Slice of Life Iyashikei works of the other magazines, often features more action-heavy like Yumekui Merry, horror-themed like School-Live!, not to mention two Puella Magi Madoka Magica Expanded Universe manga, Puella Magi Kazumi Magica and Puella Magi Suzune Magica, both of which happen to even more darker and bloodier than their parent series. Massively Multiplayer Crossover: Kirara Fantasia , a fantasy RPG which takes the girls of various Kirara magazines and gives them fighting prowess. Network Red-Headed Stepchild: Forward is a magazine edition, in that it has very different editorial directions, despite sharing the moe connection with the other four. Word Salad Title: "Kirara" ("Shiny") is not particularly meaningful as a title, and "Caret," "Miracle" and "Forward" are not helpful additions to "Kirara" title-wise.